I know that a lot of bloggers have done Australia East Coast backpacking guides however I wanted to do this travel guide specifically aimed at 20 somethings. This blog post includes all of my top East Coast recommendations including most importantly, which hostels to actually stay in at each place. I’ve not included a time frame: how long it takes simply depends on how quickly you travel. You could probably do it all in a month however I did it in just under two. There’s a lot to see on Australia’s East Coast so if possible I really wouldn’t rush it. I’ve been asked a lot of times about my highlights and while the obvious: Fraser Island, Whitsundays, Byron Bay etc were on there, it was actually the lesser known places, the outwardly ‘less exciting’ destinations that really stick out for me. I’ve included these places in the list below. I predominately did the East Coast by Greyhound bus, taking a few road trips in between. I know a lot of people will say that there are cheaper bus companies out there other than Greyhound and it’s true, but I went for that option simply because it was the easiest to organise. In hindsight, a lot of things surprised me about travelling down Australia’s East Coast. It surprised me how beautiful it was, and yet how certain stops reminded me so much of other places closer to home. It actually surprised me how much cheaper it was than I’d expected (if you’re interested in this I can do a specific budgeting post). The other thing that I found really nice about backpacking the East Coast was that I kept bumping into the same people time and time again because everyone’s pretty much doing the same thing (only north or south). This is so great if you are a solo traveller. So, are you sitting comfortably? Here’s my 20-something travel guide to Australia’s East Coast. Like most people, I started my East Coast travels in Cairns, at the top part of the East Coast. It made sense for me to start there and head downwards because I flew into Oz in October meaning that the upper part of the East Coast wasn’t too hot at that point and the lower part would be warm and sunny when I got there in December. There’s not a heck of a lot to do in Cairns (apart from a night out at Woolshed maybe) however it’s great as a base to explore from so give yourself a few days there. In terms of things to do I would recommend doing the Barrier Reef from Cairns as this is where most of the tours depart. If you are able to you should also rent a car for a day, I would recommend doing this amazing self-drive waterfall and swimming hole loop. To do it drive south via the gillies highway, route 25 to Josephine Falls and then loop back on the A1 to Cairns. You’ll pass lots of waterfalls, swimming holes and lakes along the way. Alternatively, you visit them with an Uncle Brian’s tour if you can’t drive. You can see my wild swimming recommendations here. Hostel wise, I would recommend Mad Monkey Backpackers Village. It’s centrally located, chilled yet sociable with good wi-fi, free breakfast, a small bar and a pool. If you really want to party then the obvious choice would be Gilligan’s hostel. This party hostel is infamous and its club is the biggest in town (and costs a lot of money to go in if you’re not a hostel guest). From Cairns we rented a Wicked camper van and took a four day, three-night road trip north to Cape Tribulation and back. This was without a doubt one of the highlights of my trip and something that I would really recommend doing if you can. Cape Tribulation is the highest point of the Daintree rainforest, a stunning area full of jungle hikes, swimming holes and gorgeous, empty beaches. There are a couple of hostels that you can stay in at Cape Tribulation but I liked the way we did it, renting the van and parking up at camp sites over night, then dropping the van back in Cairns. Magnetic Island was one of the most beautiful places that we went to in Australia. Located just off the coast from Townsville on the mainland, Magnetic boasts gorgeous beaches, hidden coves, wild koalas amongst other wildlife and scenic hikes. It’s a really popular backpacking destination, partly because getting around on the island is so fun. The roads are pretty rundown in part and the only way to get around is by renting these 4×4 open top jeeps and driving right over the massive potholes. You can read my 20 Something travel guide to Magnetic Island here. There are only two hostels on Magnetic Island. I stayed at both and I couldn’t fault either one. Base is the party hostel and is a stunning hostel located right on the beach. Be sure coincide your trip with the boozy bingo on Monday nights. YHA is a quieter hostel that’s located in the jungle. it’s a lot more peaceful but it really showcases the beauty of the island. You can spot wild koalas in the hostel grounds and even feed them there at one of the ‘Breakfast with Koalas mornings’. Our next stop was Airlie Beach, the jumping off point for the Whitsundays. Because it’s the Whitsunday’s we are talking out- the postcard Australia pictures- It’s advisable to book your Whitsundays tour as far in advance as possible. You could probably leave booking it until a few days before but I wouldn’t recommend just turning up unless you just wanted to do a day trip. What I did and what most people do, was an overnight yacht trip. There are loads of boats to choose from but the most popular backpacker and more partyish boats are Avatar and the Clipper. I went on Hammer which was I enjoyed a lot thanks to the great crew, snorkelling opportunities, nice boat and good food. However, it wasn’t that sociable and in hindsight, I wish I’d picked one of the more popular ones. Because almost every backpacker goes to the Whitsunday, Airlie is a real backpacker town and it’s actually a good place to stay for a few days. The lagoon area is really nice and it’s great for a night out. None of the hostels were much to shout about however we stayed at the two main ones: Magnums and Nomads. Out of the two Nomads was a nicer and more sociable hostel. Quiet Agnes Water or 1770, holds a special place in my heart. This little surf town is often missed but it was definitely one of my favourite places in the East Coast and it offers a nice little respite in between the full-on itineraries of the Whitsundays and Fraser Island trips. Those backpackers who do come to 1770 come because of its surf lessons which are known to be the cheapest in Australia’s east coast. We did do the reef 2 beach surf school here on our first day which was great and then ended up staying here for almost a week after that. If you’re up for nothing more than days spent at the beach and evenings playing cards and having a few drinks then this is the place for you. Cool Bananas hostel really made my trip to 1770. It was one of my favourite hostels in Australia, not because it was the fanciest or the liveliest but simply because it was the most chilled and homely. The staff were lovely and the outdoor common area was a great place to chill. It was in walking distance to the beach and as a hostel, It attracted a more laid back type of backpacker. 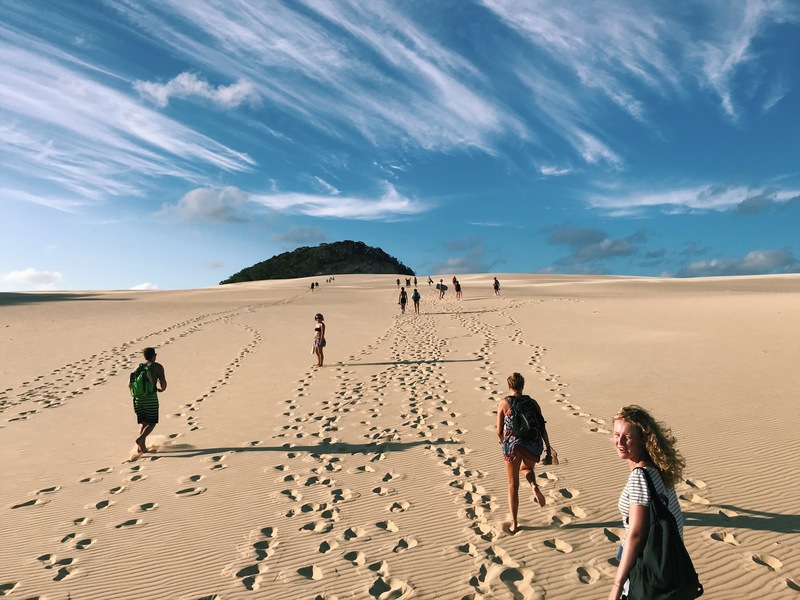 Fraser Island tours depart from a few different towns including Rainbow Beach, Harvey Bay and Noosa. We booked on Pippies tour which I would highly recommend. It’s one of the cheaper tours and includes self driving cars, camping on Fraser and the price includes everthing even food. We booked a three day, two night trip and this specific tour departed from Rainbow Beach. There’s not a whole lot going on in Rainbow Beach as it’s just a stopping off point for Fraser so I wouldn’t recommend going if you don’t need to. We got a nights accommodation before and after our tour included in the price and stayed at Pippies Guesthouse which was quite nice. I loved Noosa. It’s a laid back and sophisticated coastal town: a little bit less touristy than Byron Bay. It’s great to chill for a few beach days, eat out and go shopping. One thing I really recommend doing is spending a day doing the coastal walk through the national park which is absolutely stunning! If you want a balance between chilling and partying then Nomads is the best place to stay. It has a large outdoor seating area and a bar and club that gets really busy in the evenings with travellers. It’s also only 10 minutes walking to the beach. Brisbane lacks the wow factor of Sydney and Melbourne but it’s a nice city all the same. I don’t think you need loads of time here but a few days exploring the city, relaxing in the botanic gardens and chilling by the lagoon is a nice break. We were really excited to get to Brisbane because it was our first city in a while and it felt nice to be back in civilisation in a place where we could go shopping and stock up on the thing that was running out of. It’s an easy enough city to get around and the city hopper ferries are free to travel on which is nice. Bunk is probably the best and most popular backpacker hostel in Brisbane. It’s big and centrally located, offering some of the cleanest and comfiest (and incidentally cheapest) rooms that we had on our trip, plus it has free breakfast. It’s always pretty quiet there in the day but it’s bar/club, Birdies is one of the most popular in the city so it gets quite busy later on in the evening. We’d had enough of nights out at this point that we didn’t feel the need to go to Surfers’, which is primarily known for its nightlife, however, this is generally the next stop for backpackers after Brisbane. In hindsight, I wish I’d checked out the quieter surf towns of Coolangatta and Currumbin so I might go back to the Gold Coast if I have time. Let me know if you’ve been and how you found it in the comments below. Oh Byron- how I loved you. Yes, it’s touristy but it’s Byron: How can you not love it? For the few of you who have not heard of it, Byron Bay is a chilled Australian surf town that’s packed full of hippy style cafes, restaurants and bars with nothing much going on apart from surfing and beach parties.The only productive thing I did in a week here was do the Lighthouse walk (a must do for sunset). Aquarius is great. It’s just 10 minutes from the beach, it has a pool, great dorms with balconies, a fantastic bar and common room with loads of events going on each night, and the best thing: it has free dinner for guests every evening. After Byron, it was time to get the overnight bus to Sydney- the end of our Greyhound bus pass. A lot of people are pretty divided on opinion as to whether they prefer Melbourne or Sydney, I liked both. I’ve found that while I feel that Melbourne’s more my kind of place, Sydney trumped when it came to its national parks, beaches and coastal walks. One thing I will say though is that Sydney feels a lot bigger and getting around is more complicated. We were probably the most productive in our week in Sydney than we had been on our whole trip (or maybe it just felt like it after a week in Byron doing nothing). We stayed a week in the city and packed loads of different things into each day. These are some of my recommendations. Bag a seat at the front of the ferry and take a trip from Darling Harbour to Circular Quay (The Opera House). This ferry goes right under the Sydney Harbour Bridge and past the Opera House so it’s a great chance to get some good pics. This is really lovely and quite easy coastal walk that takes you past a few smaller beaches. I think it’s best to get the bus to Coggee and then end in Bondi where you can get food and maybe cool off in the Bondi icebergs Pool? This walk was a lot of fun and it’s a lot less well-known than the Coogee to Bondi one. Take the bus to Spit and then follow the trail past beaches, over rocks and via aboriginal paintings to the beautiful beach of Manly. From there you can get the ferry back to the Opera House. You can do the Blue Mountain national park as a day trip from Sydney and it’s something I would really recommend doing. The best way to get there is on train from Sydney central station. You can read my budget Blue Mountains travel guide here. When it comes to eating out, Newtown was one of my favourite parts of town. It’s full of vegan/veggie places including Gelato Blue, an all vegan gelato place. There are also lots of really great inexpensive Asian restaurants. Sydney’s botanic gardens ar beautiful and also located right next to the Opera House so you can sunbathe with a view of Australia’s most iconic building. None of the hostels in Sydney are amazing but Ady’s Place was the best one that we stayed in. It’s really close to Sydney’s main attractions such as the Opera House, Botanical Gardens and Kings Cross, it was sociable, had a roof top and free breakfast. If you’re planning on working in Sydney they also provide job-seeking help and work for accommodation opportunities in the hostel itself. Well, that’s a wrap. I hope that this guide has helped give you some inspiration for your East Coast Travels: There really is no better a destination than Australia for a 20 something traveller. Let me know in the comments below if you have anything else you would like me to write about or if you have any suggestions. I’m currently working in Melbourne so take a look here to follow my current and future travel adventures in Australia and beyond.